"The table was a large one, but the three were all crowded together at one corner of it: `No room! No room!' they cried out when they saw Alice coming. `There's PLENTY of room!' said Alice indignantly, and she sat down in a large arm-chair at one end of the table. `Do you mean that you think you can find out the answer to it?' said the March Hare. `Then you should say what you mean,' the March Hare went on. 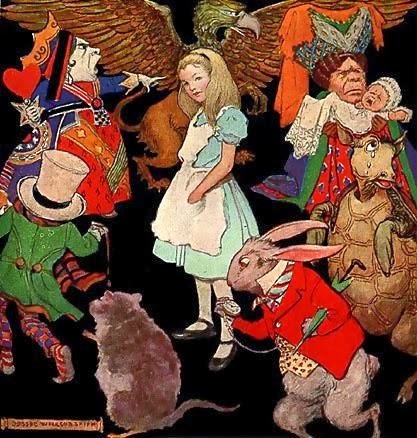 `It IS the same thing with you,' said the Hatter, and here the conversation dropped, and the party sat silent for a minute, while Alice thought over all she could remember about ravens and writing-desks, which wasn't much." LOL I adore this... I remember when I first read this... translated into Russian. I was about 10 years old. But in English it sounds way better.